SOS Hydra Mask (15ml), which is from Clarins new range of SOS masks - this one adds hydration and feels really refreshing on the skin. Gentle Refiner (15ml), which is a very gentle exfoliating cream - ideal for those with sensitive skin. Relax Bath & Shower Concentrate (100ml), which is perfect to use after a busy or stressful day to help you unwind and relax. It has a very soothing, calming scent and I love to just lie back, inhale and switch off. Moisture-Rich Body Lotion (100ml), which is a non-greasy, yet deeply moisturising body lotion that absorbs quickly to leave the skin plump, soft and comfortable. Hand and Nail Treatment Cream (30ml), which is one of my favourite hand creams because it is non-greasy, has a light fragrance and leaves my hands soft and supple. This mini size will be perfect for my handbag! There is the perfect balance of face and body products in this pouch and the pouch itself is a good size for throwing in your handbag. 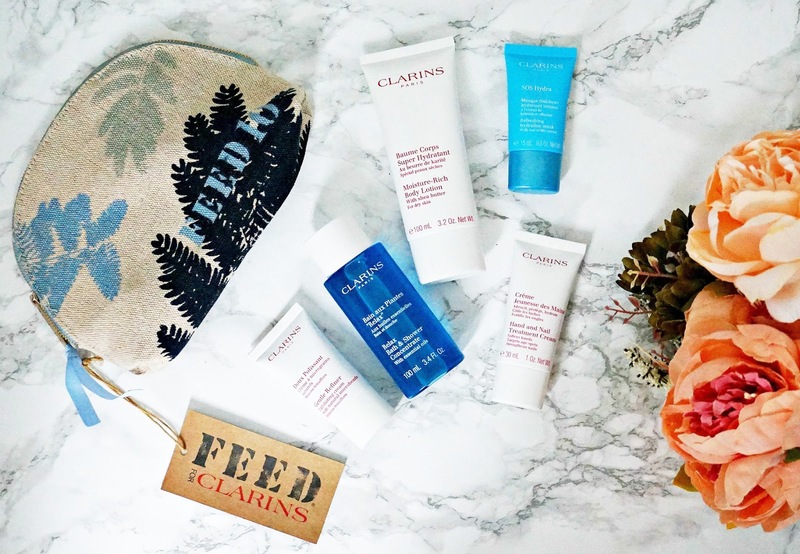 To receive this, you need to buy 2 Clarins products (1 to be skincare) before September 30th and if you are super-quick and make your purchases today in Debenhams, you will receive 10% off your order as their Spectacular Event ends tonight at midnight tonight! If you would like to read more about FEED, you can do so here. This GWP represents a fantastic opportunity to change the lives of under-privileged children - will you be making a purchase? All products are bought by me, unless otherwise stated. Clarins kindly sent me this gift with purpose. Opinion is always my own.